A long time ago in a galaxy far, far away, an Imperial battle cruiser swooped down across the screen to the strains of a full symphony orchestra. Movies and movie music have never been quite the same since. This past weekend (January 25-27), Gemma New and the St. Louis Symphony Orchestra reminded me of that magic moment as they performed John Williams's score for "Star Wars: Episode IV - A New Hope" (or, as it was known back in 1977, plain old "Star Wars") while the film played on the big screen above them. And as thrilling as it was to hear that big, old-fashioned sound in a theatre back in the day, nothing quite compares with the visceral impact of hearing it performed live by an 80-piece orchestra. That's especially when it's the exemplary members of our own SLSO. When we attended on Saturday night, the horns and brass were in excellent form, the percussion section was impeccably precise, and the orchestra in general performed at a very high level. 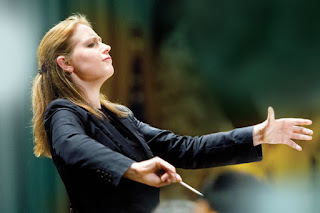 On the podium, Ms. New did her usual flawless job conducting in synch with the film--a skill that has apparently become increasingly important for younger conductors in recent years. Williams sprinkled his score with lots of fun orchestral details that aren't always noticeable in a movie house, but which emerge with great clarity live. That includes the reference to Stravinsky's "Rite of Spring" for C-3PO's trek across the Tatooine desert, the menacing low brass passages for the Empire and its minions, and the grand triumphal march at the end, which has always reminded me of the patriotic declarations of Elgar and Walton. Yes, the film remains a Certified Rouser, but hearing the score live gave me an opportunity to appreciate Williams's consummate skill as a composer once again. Fans of the "Star Wars" series probably noted that the version of the film screened this weekend was not the original 1977 release, but rather the digitally remastered 1997 re-release, in which many of the original special effects shots were enhanced and a few new scenes using computer animation were added--most notably a meeting between Han Solo and Jabba the Hut. It looked wonderful on Powell Hall's big screen, and the dialog tracks were crystal clear. The hard-of-hearing members of our party also appreciated the captioning, which seems to now be a standard practice for these events. Big movie events like this one have become very popular with symphony orchestras for obvious financial reasons. Certainly "Star Wars: A New Hope" attracted a huge, enthusiastic crowd that filled nearly every seat in Powell Hall and gave the orchestra a happy standing ovation at the end. How many of them will return to see the orchestra without a movie screen over their heads is another question, but as far as I'm concerned anything that exposes folks to the splendid playing of the SLSO is a good thing. Next at Powell Hall: Matthias Pintscher conducts the St. Louis Symphony Orchestra and pianist Kirill Gerstein Friday and Saturday at 8 pm, February 1 and 2. The concerts will consist of Rachmaninoff's "The Isle of the Dead," Scriabin's Piano Concerto, and Mendelssohn's Symphony No. 3 ("Scottish"). The concerts take place at Powell Symphony Hall, 718 North Grand in Grand Center.